Over the last week, we have been working hard improving some of the behind the scenes features in WPForms. I’m quite proud to show you our new improved form entry management system which made up bulk of the changes in WPForms version 1.1.5 and 1.1.6. The main thing you’ll see in the Entries table is the ability to “star” aka favorite each entry and mark it as read. You can also sort the entries by the status and download all form entries in a CSV file. When you click to view an entry, you’ll see several entry specific actions. Custom notes is very handy if you’re using WPForms as a basic CRM. We added several enhancements and bug fixes in version 1.1.6. 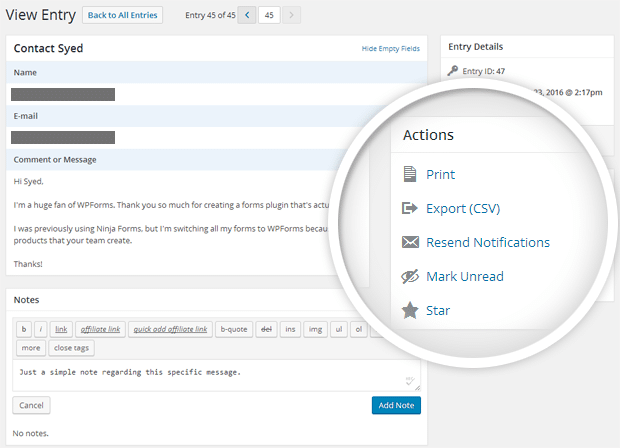 The most notable enhancement was that we added support for WordPress Zero Spam plugin which a lot of you have asked for. Later this week, we’ll be launching our GetResponse add-on as well as improvement to our smart tags for better notifications. If possible also provide a way to display the Entries on the front end of the site. I haven’t seen any Forms plugin do it but got this request from many clients. For example, some site owner wanted to take support request using Gravity Forms and then show that request to his support people when they logged into the site (display on the front end and not WP admin panel). Then wanted to have them reply to the Entry from the front end. Similar case was with another client who wanted to take Student Enrollment enquiries and then have sales people call the student for enrollment. Sales people would just login to the front end of the site, look at the enquiry and call the student. They were not supposed to see WP admin panel. 2. Provide auto-number generation for number fields. 3. Generate PDFs of submitted form data (for the form entry). There are quite common use-cases for these. For example, create a form for issuing a Receipt for payments made by cheque/cash. Fill the form, Receipt No. is read-only and gets auto-generated. PDF gets created for the form entry and gets attached to it. Print the receipt and give it to the clients or just email them. I know there are other ways to handle this but its just one use-case. I need to come in and second the request for front-end viewing. I have seen one or two plugins offer this. But this would be extremely advantageous and could be used in a number of ways. As someone who paid for the license for WPForms, what is your process to add things to the ‘immediate’ roadmap. I would like to know when you might be building this feature. I recognize it is involved, but it would really blow the use cases for the plugin out of the water. I could see it double the scenarios where your plug in could be used. 3) Form to form management – Need to be able to add a bit of data to the DB for this user. For instance my webhosting client, the user needs to add a domain name. Then if they want to remove/delete or add another they need to be able to see which domain names they have already submitted via WPform and then add another, or hit a ‘request delete’ button. This is something that is on our radar in the future. I think our initial implementation will be to provide a shortcode that can be used to display a simple table of the entries for a specific form. Is there any way to get the Custom Notes to print? We have a scenario where we need to add additional info after the applications are submitted (For Office Use Only) and then provide printouts as legal documentation. The ability to add a Custom Note to each entry is perfect, except those aren’t included when we click Print. is there a way to download entries csv file sorted by particular set date range? For example how you can download order export csv file based on set date range. We don’t currently have the ability to limit the date range of entries included in a CSV export — for now, the easiest way to do this is to open the CSV with a spreadsheet program like Excel, then remove any rows of entries you don’t need. I agree, though, that this would be a super useful addition to our CSV export tool! I’ll make note of your suggestion on our feature request list.